The name’s Bond... James.... ok I’ll stop. Typically, I’m not a fan of movie cars. To be honest with you, I didn’t really know the Aston Martin DB10 was technically a “movie car”. Ever since I first saw pictures of it online, I assumed it was a bespoke, limited release sort of thing. It wasn’t until I got this model and started really reading up on the car that I learned what it really was. Both Aston Martin and the movie’s producers wanted to build James Bond a completely unique car for the most recent film in the series, Spectre. This was to celebrate the 50th anniversary of the first time Bond drove an Aston, the legendary DB5. Sean Connery starred as Bond in Goldfinger, which was the first of twenty-four movies. Half of these featured an Aston Martin for Mr. Bond to drive. A small team at Aston Martin hand-built 10 DB10 cars, 8 of which were used in filming Spectre while 2 others were used as show cars. They aren’t street legal, so they are not production cars. However, one of the show cars were sold at a Bond themed Christie’s auction for a cool 2.4 million pounds, or about $3.5mil in American monies. Depending on which article you read on the internet, either all cars survived filming or only three survived. The one auctioned was to be the only one ever offered to the public. The cars featured the 4.7L V8 from the Vantage, mated to a 6-speed manual. Word on the street is that the radically redesigned 2019 Vantage was be based on this car, or the DB10 was actually based on that car’s design sketches, depending on who you ask. 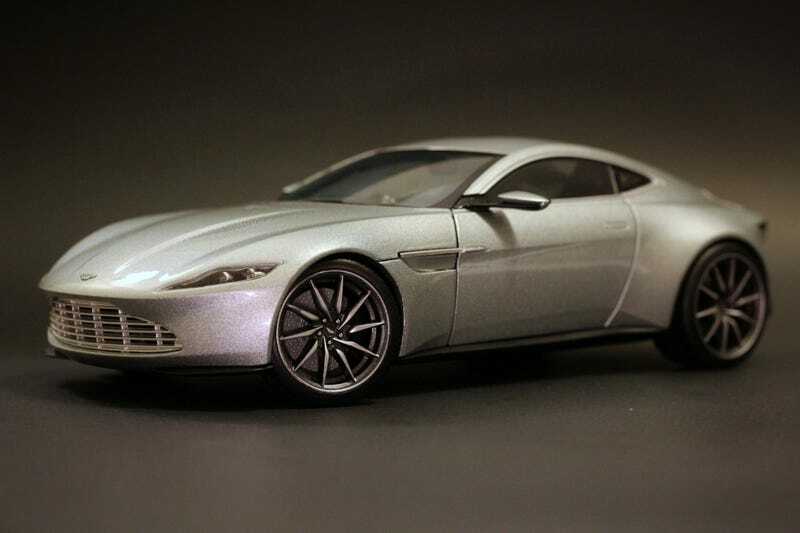 I’m a huge fan of the 2019 Vantage’s design too, so there’s another diecast attack on my wallet. Naturally, there are hundreds upon hundreds of James Bond related diecast models. Most have pop-out missiles, machine-guns, and freaking laser beams attached to their heads. Personally, I don’t care for that, and I know I’m probably in the minority, but hey this is my hot take, not yours! Thankfully the only gadget this model has is a set of toggle switches duct taped to its dashboard. This, to me, was passable and would be acceptable for my shelf. Other than that, its a totally clean design, and that’s why I had to have it. Since its marketed as a James Bond product, the “market value” of these models have been crazy high. So high, in fact, that I never thought I would come to own one. It took a strange series of events that landed one on my shelf. Honestly, I don’t think this model commands that premium price tag. Its certainly an incredible piece, but from what eBay prices will tell you, I’d rather buy something from AutoArt. Don’t get me wrong, its definitely a premium 1/18 model, it just didn’t strike me as that premium. The paintwork on the DB10 is just about flawless. The vents on the hood are painted on though, but that’s understandable considering they’d have to be laser-cut at this scale. The front badge is also an actual badge! No stickers or tampo paint here. The front clamshell opens to revel the engine bay, but there’s not much to see buried way in there. All components have their own colors, but I got a strong plastic vibe when I peaked under the hood... I mean bonnet. The interior of the car is amazing. Different textured materials mimic the real deal and details like stitching, (read this in a British accent) aluminum pedals, and seat belts really set this model apart. From what I’ve read across the Internets, the gauges didn’t work, there was a button for a flamethrower, and neither the windows nor air conditioning were functional. The shut lines of the trunk seem to be wider than those of the doors, and yet there wasn’t a chance that Bond was getting his golf clubs in there once opened. The wheels are another highlight of this model. I love this design, and Hot Wheels nailed it. They’re painted right, proportioned right, and have the right amount of rubber around them. You’re seeing the gist of the brake rotor and caliper details, though. The model wears the same license tag as the car in the movie. My last complaint, if you even want to call it that, is the front grille. Although its perforated, I still find it appears too much like plastic especially around the trim. That surrounding trim shouldn’t be visible either, as the real car only has horizontal billet bars. That’s really all I can say about this DB10! I’ll shut up and let the photographs speak for here on out. Its paintwork and smooth lines put it near the top of my favorites list of my collection. Its perfect for any Bond fan or Aston Martin fan, and through a loophole still fits in with the rest of my supercar prototype models.